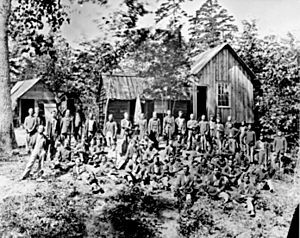 The 21st Michigan Infantry, a company of Sherman's veterans. The Union Army was the name of the army that fought for the Union during the American Civil War. It was also known as the Federal Army, the U.S. Army, the Northern Army, or the National Army. It consisted of the small United States Army (the regular army), increased by many regiments supplied by the Northern states militias. Most soldiers were volunteers but some were drafted. The Union Army fought and defeated the Confederate States Army during the war, from 1861 to 1865. Of the 2.5 million men who served in the Union Army during the war, about 9.5% were African American, about 360,000 died from being hurt in battle, disease, and 280,000 were wounded. General George B. McClellan with staff & dignitaries (from left to right): Gen. George W. Morell, Lt. Col. A.V. Colburn, Gen. McClellan, Lt. Col. N.B. Sweitzer, Prince de Joinville (son of King Louis Phillippe of France), and on the very right - the prince's nephew, Count de Paris. Union Army Facts for Kids. Kiddle Encyclopedia.